GTV has just announced a new idol drama starring Korean actress Park Shin Hye and Taiwanese actor George Hu from K.O.3an Guo. The drama will be an adaptation of the popular manga/anime series “Hayate the Combat Butler” . GTV is reportedly going to be paying for all expenses including plane tickets, hotel rooms and meals for the actress as well as her manager and assistant. She will also be bringing her own personal hair and makeup artist along during the two month filming period. In preparing for the role, George Hu has been put under extensive training such as practicing martial arts, dancing, as well as singing. As the all-purpose combat butler, George is confident in showcasing not only his fighting skills, but also his ability to do house chores, “I’m great at cleaning the house. I’m also okay at cooking.” He even revealed that he once thought of becoming a chef too. When Park Shin Hye visited Taiwan in the beginning of August, she met with George and had a hot pot dinner together. They didn't interact much due to the language barrier. George described Park Shin Hye as being “very quiet, skinny, and very cute," and looks forward to working with her. As for GTV's other high profile project, "Extravagant Challenge", they have yet to make an official announcement on when filming will begin. Despite recent casting rumors, there was no mention of the drama's participation in the upcoming Taipei Television Festival. In addition to "Hayate", Meteor Garden producer Angie Chai will also promote her remake of "My Girl" starring Jimmy Lin at the showcase. So she's confirmed to act in d drama! Will alwiz support her. Best of luck to her, Shinhye fighting!! owez support shin hye...good luck..i love sukkie?shinhye 4ever..
congratulations and good luck shin hye. we love you and will always support you. 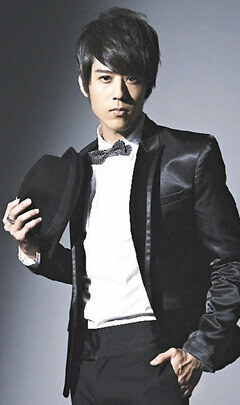 and i love george hu too! hope they can be good friend !! I have nothing against these two. go,park shin hye idol kaya mo yan.!!!hoooo! as a fan of park shin hye..i wish her good luck for the new project...whoever may the leading man be..but hopefully ill see her work again with Jang Geum Suk..thats my wish..i had been addicted with korean novelas since i saw their love team(shinhye and geum suk) in the tv series hes beautiful...God Bless Always..